Since the introduction of the TR19, it has now been made into a law that you are required to present a document showing that your kitchen has been cleaned to this high standard. The TR19 document is to be presented to your insurance companies so that in the event of a fire, you will not be held accountable, and instead the company in which cleaned your kitchen will be the persons liable. One of the areas which are covered in the cleaning process of a TR19, includes all of the ducting. It is required to be cleaned to a point where there is no grease along the ducts that exceeds a thickness of 500um. this is to prevent fire hazards from occurring, due to the heat, airflow and flammability of the grease in a kitchen. Over time your extraction fans will build up dust and grease deposits which can be very harmful to your kitchen. 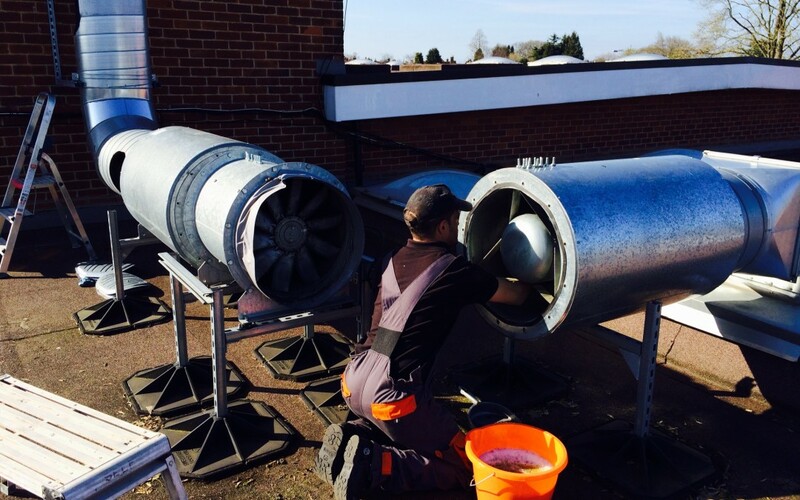 Not only will the ducting be effected, but your entire business due to the air not being extracted properly. It is harmful for your kitchen as the clearance of the fan blades is reduced between the blade edges and the inner casing. This will slow the fans rotation per minute down which will make the motor work harder. This will cause damage to the motor which could lead to costly repairs. If the air is not escaping this will end up being absorbed by the walls and ceiling. Mold will build up very fast due to the dampness. This will be very expensive and cost your business time and customers due to the need to strip down walls. If a fire takes place from areas within your kitchen such as the ducting, and you are not able to provide a TR19 to certify that your kitchen has been cleaned to the correct standard, you will be liable for any persons involved in the fire that have been harmed. This will mean prosecution, loss of business, large fines, and imprisonment if the damage caused to the persons involved is extensive enough. Here at 1st Commercial Cleaning, we hope this information will help you realise the importance of maintaining your kitchen standards as well as obtaining TR19 Certification. If you require a professional team of highly trained experts to give your commercial kitchen a clean, call us now and request an engineer on: 0800 020 9132.